Weston Ranch High School will celebrate the coming end of the school year this Saturday, April 6, during its Prom. This year’s event will take place at the Brookside Golf and Country club in North Stockton. “Under the Stars” is this year’s theme and students can expect to spend a beautiful evening dancing, sharing stories, and collecting new memories. DJ Ro Sham Bo, a favorite amongst the students, will return this year and provide the music. In addition to the music, yummy appetizers will be available, as well as a photo booth and professional photos by Lifetouch. “Under the Stars” will also be a night to elect a Queen and King. 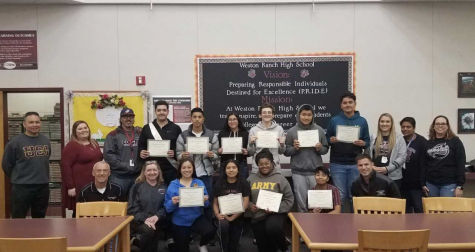 After a vote, students and staff selected a royalty court featuring Jucel Suero, Jennie Tern, Mary Ann Le, Renny Manansala, Ashley Castaneda for Queen and Josh Ico, Ricardo Resendiz, Armando Mendoza, Raul Melgarejo, Ja’Darius Encalade for King. Prom is a time-honored tradition in high school, sort of a rite of passage. It’s also a night to celebrate life and spend time honoring your friends. Here’s hoping “Under the Stars” offers and fulfills both of these goals. Have a happy and safe Prom, Cougars.